We are proud and humbled to have been part of a business case study prepared by Strathmore Business School for consumption at the Academy of Management annual meeting held in Chicago, USA from 10th to 14th August 2018. An interview of the Managing Director of Epsilon was also presented at the same conference. The basis for this interview was to seek the views of a female leader in the publishing, in what is predominantly considered to be a male dominated field. The premier global management conference draws more than 11,000 management researchers and leaders in academia from 92 countries worldwide. 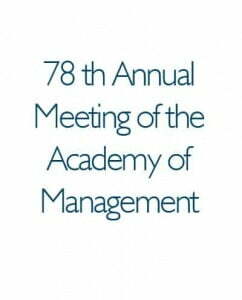 The Academy of Management is the preeminent professional association for management and organisation scholars. Their worldwide members are professors and Ph.D. students in business schools at universities, academics in related social science and other fields, and practitioners who value knowledge creation and application. During the conference, top management and organisation researchers from around the world revealed their latest research findings addressing some of the most impactful issues in the field. The conference theme “Improving Lives” explored how organizations could contribute to the betterment of society. Topics included the #Me Too movement, corporate leadership and the continued challenges women and people of colour face in the corporate world. We are humbled by this and we commit to continue driving positive social impact in the East African region as we set the benchmark lines for transparency, integrity and sustainability.